I find that everyone prefers their own consistency when it comes to nut spreads. My suggestion is either adding olive oil or coconut oil even an avocado to it with lemon. It’ll give it that a nice texture to it for almost any type of use. I’m definitely going to recreate the cashew “cream” spread and do something different with it….stay tuned! Who needs bread when you can make sweet potato toasts? 1 tspn olive oil I used the garlic olive oil from Trader Joe's. seasonings crack a little bit of pink Himalayan salt, pepper, turmeric and sprinkle garlic powder. You'll want to clean the skin of your sweet potato. You won't want the dirt on them or any little ugly spots. The skin on adds a nice texture like the edges of the bread. Once you clean up your potato you'll want to slice it long ways. I used a mandoline for this process and "slithered" the sweet potato. Next you'll lightly coat your baking sheet with olive oil or coconut oil spray. Then you'll lay your sweet potato slices on the pan and give them a coat with olive oil (you can use a brush for this so it's not too much or eliminate the olive oil over top) + seasonings. I flipped them over and also season the other side minus the olive oil. Place your sweet potato slices in the oven for 8-10 minutes (until you notice a brown) then flip them and do the same on the other side. Carefully take them out of the oven and let them cool for 5 minutes before topping. Once you top them you'll want to take a good picture before you bite into them! If you're looking for an alternative to cream cheese and don't mind playing around with alternatives, this is a recipe for you! seasonings pink Himalayan salt & pepper to taste + garlic powder if you want extra garlic. The most important part of this recipe is soaking the cashews with boiling water and let it sit for 2 hours. Once your cashews are soaked, they'll be ready to blend. (I used a food processor but a blender works perfectly). Be sure to save the water they soaked in! Add your cashews into your processor (or blender) with the garlic cloves, seasonings, the nutritional yeast (optional) and 1/3 cup of the water they soaked in. (You'll add another 1/4 cup if you want to get it to a smoother consistency). Blend, blend, blend. Be sure to taste and add anything that you feel it needs. 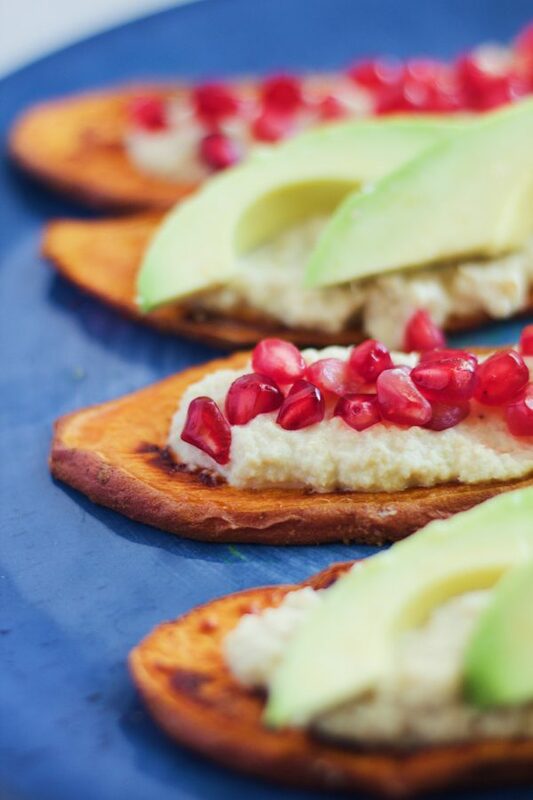 Once it's done you can spread it over sweet potato toasts and top with pomegranate or avocado. You can also use this for a cream sauce, just be sure to blend it down more. You can always give the cashew "cream" spread some flare with any herbs or spice like a chipotle. Please do not get intimated by the prep time. It is only this long because the cashews have to be soaked.